Don’t worry. It’s not personal. Our companion animals, domesticated thousands of years ago, are descended from primarily nocturnal predators. Over millions of years they developed an acute sense of hearing in order to find prey in the dark. Cats and dogs have a much sharper sensitivity to sound than humans. The eighteen muscles in a dog’s ear let it precisely locate the origin of a sound, as do the thirty-two muscles of a cat’s ear. While dogs can hear up to an octave and a half higher than humans, cats hear up to an octave higher than a dog. With even more sensitive hearing than dogs, cats can detect the tiniest variations in sound; if a mouse rustles in a bush thirty feet away, the cat knows exactly what’s for lunch. So while it is fun to imagine that our pets break into dance to “Tabby’s Mix” on the iPod moments after we leave for work, cats and dogs don’t really care for rock, reggae, or even clas­sical. For them, human music is more like a drop in an ocean of noise that continually floods their senses on a daily basis. It’s tricky to say whether or not music as we know it even exists for our pets. After all, music is a human construction. While some species—birds and whales, for instance—have their own “songs,” these are really more a function of commu­nication than artistic expression. Yet these songs have the capacity to elicit an emotional response from both human and animal alike. Composer David Teie has always had a deep curiosity about why humans respond to music. During his twenty-year career playing cello with the National Symphony Orchestra, Teie developed what he calls a “universal theory of music,” which suggests that our emotional connection to music is a response to a coordinated remix of sounds we learn in the womb. Everyone has songs they love, but there’s really no scien­tifically based answer as to why we do. According to Teie’s theory, we are relaxed by music that shares a rhythm with our mother’s resting heartbeat, and we tend to prefer instru­ments—like the violin—that play around the pitch of her voice. To expand his universal theory of music to include the animal world, in 2009 Teie reached out to Charles Snowdon, a primatologist and professor of psychology at the University of Wisconsin–Madison. Snowdon supplied Teie with record­ings from a colony of cotton-top tamarins housed in the UW’s Department of Psychology. Some of the recordings captured calls of distress made by tamarins during veterinary appoint­ments. Other samples included chirps made by contented tamarins; fast and frantic to the human ear, but obviously reas­suring to their own. By employing such compositional techniques as pitch and tempo, Teie turned the assortment of calls into songs with melody and rhythm that he felt would lead to either distressed or contented states in the tamarins. Teie brought the two finished tamarin-based songs to Snowdon’s lab and played them for the colony along with two other human-based songs designed to elicit similar responses in humans. As hypothesized, the music designed from the friendly tamarin calls led to more affiliation-based behavior, while the music designed from calls of distress induced a state of fear in listeners. But only in the case of songs designed from tamarin sounds. The human music elicited little response. The tamarin songs became the first example of species-specific music, a term coined by Teie that same year, that refers to specially designed compositions that incorporate the pitches, tones and tempos familiar to any particular species. Named one of the best ideas of 2009 by the New York Times Magazine, Teie and Snowdon’s species-specific music was met with a flurry of press attention and a public eager to share anecdotes about the kind of music their pets like to hear. The enthusiastic response got Teie and Snowdon thinking about how they might expand their species-specific music research and about the commercial implications of this expansion. While zookeepers and research centers might be interested in species-specific music enrichment as a practical tool for calming or entertaining wild animals in captivity, millions of Americans keep an animal for companionship. The American Pet Products Association estimates that 65% of households in the United States shelter around 164 million cats and dogs, not to mention the less frequent extent to which pet owners provide food and homes for birds, fish, reptiles, rodents, amphibians, and the occasional exotic animal. Americans spent more than $60 billion on their pets in 2015. While more than $50 billion goes to such necessary supplies as food and medicine, many pets find themselves on the receiving end of increasingly diverse and technologically-sophisticated products. In a world where humans can use GPS to monitor a pet’s location (Tagg Tracker, $100), precisely schedule and measure mealtimes (Petnet SmartFeeder, $149), and even video conference with Rex from afar (PetChatz, $349), it doesn’t take a huge leap of logic to see the market for pet music. Any inquiry into animal musicality asks for a diversity of perspective: imagining what life is like not only for other humans, but for other life forms as well, and along the way working towards a better understanding of both. There is a difference between thinking of animals as humans and recognizing the similarities we share across species. For example, we do not actually cut them off a square of lasagna at the dinner table, but we do feed pets when they are hungry. We do not take pets to our family physician, but we do take them to their own doctor extensively trained in their unique biology. Even though pets have a different body, they still eat food and get sick, just like we do. The fact that this distinction is not as clear for musical pref­erence demonstrates just how little is known about the nature of music itself and how it operates in the human brain. But that’s not for lack of effort. Animal music has been a topic of interest for caretakers and researchers alike for decades. The bored animal in captivity will seek its own stimulation, as colorfully illustrated by an octopus at the Santa Monica Pier Aquarium who broke a valve in its tank and flooded the building because it was something to do. The pet owner who comes home to find a broken vase and the cat blaming the dog knows this problem too well. However, inconsistent results have discouraged the field from advancing. For example, one study suggests that chimpan­zees display less aggressive behavior in response to music, but then another says music does not work for horses. One study says that soundtracks of outdoor “nature sounds” are just as good as music for gorillas, and the other says they are not. Researchers have even studied the effects of music on fish, but have found only contradictory conclusions. Of course, it is only by asking questions that we learn which further questions to ask. Or that we asking the wrong ques­tions. Researchers in Japan played a Mozart concerto for rats and found that, for the most part, the rats could not even hear it. This is because rats do not pick up on frequencies below 4,000 hertz (Hz), the level around which most human music is found. While the tamarin study offered clearer direction for further research in captive animal enrichment, Teie and Snowdon teamed up again in 2014, along with then-undergraduate student Megan Savage, to study the effects of species-specific music for companion animals. Although cats and dogs each come in a variety of breeds, the relatively small difference in size between cat breeds made for a more precise experiment in the lab—the subjects being less likely than dogs to be affected by potential differences in auditory sensitivity. For this study, Teie composed music he hoped the cats would find interesting and pleasant. Kittens are born deaf, so their sense of sound comes from the world around them. They learn rhythm as their ears perk up to chirping birds, suckling siblings, and the purring of fellow cats, including their mother. Cats also vocalize an octave higher than humans, and their calls more often than humans include sliding frequencies. Therefore, the music itself has to appeal to the auditory perception of another species beyond the basic communication of vocal signals. A distress call only means so much to an animal, and our mother’s heartbeat alone offers quite a different experience than a song with a beat. Music’s ability to communicate an emotion facilitates social cohesion and coordination of behavior, an adaptive function espe­cially useful for a social species like humans. Music also increases cognitive skills and even offers beneficial physi­ological effects and positive neurochemical changes. While animals, as far as we know, cannot themselves arrange their own songs, the evolutionary benefits of music could address similar needs for them. To test their species-specific cat songs, Snowdon and Savage brought a laptop and two speakers to the homes of 47 cats and played them each four compositions: two songs composed for cats and two for humans as a control. “Cozmo’s Air,” a cat song, used the tempo of purring, 1380 beats per minute, with melodic sliding frequencies covering 44% of the sample. “Rusty’s Ballad,” another cat song, used suckling as a tempo, with 55% melodic sliding frequencies. The average pitch of the cat songs was about two octaves higher (1.34kHz) than the classical music (335Hz) Snowdon and Savage used as a control. The human music also carried a significantly slower tempo, less than 70 beats per minute, with little to no sliding frequencies. The researchers measured two types of behavior: avoidant/fearful, and orient/approach. Avoidant/fearful behaviors included leaving the room, hissing at the speaker, and arched backs. Orient/approach behaviors included purring, getting close to the speaker, and scenting the speaker by rubbing against it. Cats exhibited eight aversive responses to cat music and nine to human music out of 94 total tests with each type of music; but the overall average of positive responses to cat music was 1.5 per cat, or 141 total positive responses. On average, the cats responded positively to the cat music in half the time it took for them to display any positive behavior towards the human music. The study concluded that domestic cats do indeed express interest in and responsiveness towards music composed of species-specific elements. The researchers again found that media outlets were intrigued. One headline read: Move over Mozart: Study shows cats prefer their own beat. However, they also heard reports from a number of humans who have successfully used “Cozmo’s Air” or “Rusty’s Ballad” to welcome new cats off the streets and into their homes. Cat music might also become a useful therapeutic tool for separation anxiety, loneliness, and grief, experi­ences often reserved exclusively for humans. Most of us make good decisions on behalf of our pets to help them live happy, healthy lives. We use our own life experience to fill in the gaps. There’s no way to directly ask them what they need. This is where science can fill in the blank. Music in particular opens up a line of communication between humans and animals, a useful tool for the caretaker in solving the problems associated with the welfare of another species. With more research, species-specific music can be developed to influ­ence important, yet traditionally difficult-to-manage animal behaviors. Since the success of his second species-specific experiment with Snowdon, Teie has begun and completed a Kickstarter campaign for $20,000 in support of the creation of the first-ever cat music album. In November 2015, 10,000 backers helped Teie exceed his goal by over $220,000. Teie’s website, musicforcats.com, today features the fruits of his work with Snowdon and subsequent Kickstarter campaign: the first-ever scientifically-backed musical compositions for cats, downloadable as singles or as an entire album. 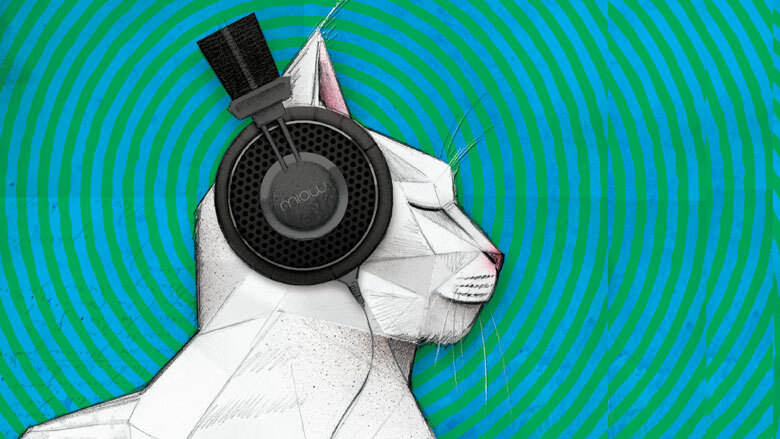 Indeed, Music for Cats became a success by using the scien­tific method to solve a specific problem, but it also sets a good example for what research can do. The study of animal musi­cality represents an exercise in benevolent curiosity, seeking not only to understand more about the natural world, but to make all life better.